Home / FM / Hydraulic Machine / What is Hydraulic Intensifier? The hydraulic intensifier is a mechanical device which is used to increase the intensity of pressure of the fluid. It utilizes the energy of a large quantity of liquid at low pressure. Some hydraulic machines require high pressure for working but this high pressure can’t be obtained by using a pump. Some of these hydraulic machines are hydraulic press, hydraulic ram, and hydraulic lift etc. These machines require high pressure for this operation to obtain the required amount of pressure. A hydraulic intensifier is mounted in between the pump and the working machine. It has two types one is single acting and the other is double acting. Here we will discuss the only single acting hydraulic intensifier i.e. it supplies high-pressure liquid during the downward stroke only. The double acting hydraulic intensifier supplies high pressure in both strokes i.e. in a continuous manner. Generally, a normal intensifier can raise the pressure intensity of liquid at 150-160 MN/. A hydraulic intensifier is very simple in construction; it has only three main parts, these parts are attached in a proper sequence for increasing the pressure of input fluid. These three main parts are fixed ram, sliding cylinder or ram and a fixed cylinder. FIXED CYLINDER: It is the outermost body part of the hydraulic intensifier. The low-pressure liquid comes into the fixed cylinder from the main supply. The sliding cylinder or ram slides inside the fixed cylinder. SLIDING CYLINDER OR RAM: It is the middle part of hydraulic intensifier i.e. it slides in between the fixed ram and fixed cylinder. This is the only moving part of this device. It slides under the action of hydraulic force. Sliding cylinder contains a high-pressure liquid which is supplied to it through the fixed ram. FIXED RAM: It is the innermost and smallest part of the hydraulic intensifier. It is surrounded by a sliding cylinder. The high-pressure liquid is supplied to the machine through this fixed ram. VALVES: Hydraulic intensifier consists of four valves for easy understanding we can name them A, B, C and D. ‘A’ and ‘D’ allows low-pressure liquid from the supply into the device. The liquid comes in from valve ‘D’ goes into the fixed cylinder and the liquid goes in through the valve ‘A’ goes into the sliding cylinder. Valve is for exhaust purpose i.e. it permits the low-pressure liquid from the fixed cylinder to be discharged to exhaust. The valve ‘B’ is used to supply high-pressure liquid to the outlet of intensifier which is attached to hydraulic machines. As discussed above hydraulic intensifier is used to increase the intensity of fluid pressure. It's working based on the fluid movement in it. 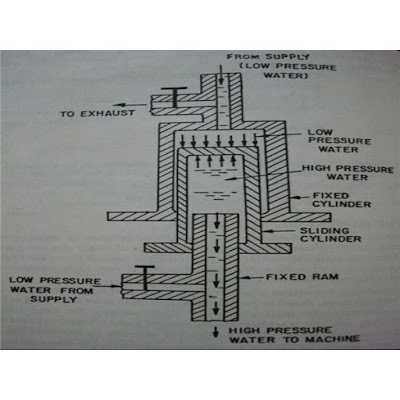 The liquid from low pressure comes in and at high pressure goes out to the machine or outlet. In the starting movement, the sliding cylinder is at its rest position i.e. at the bottom-most position. Now the liquid of low pressure comes into the fixed cylinder through valve ‘D’ and fill it properly. Now the valve C, B, and D are closed. The only valve ‘A’ is opened which permits the low-pressure liquid into the sliding cylinder or ram. After that, the valve ‘C’ is opened which permits the low-pressure liquid from the fixed cylinder to be discharged to exhaust. When the low pressure comes out from the fixed cylinder then the sliding cylinder starts moving upwards due to the supply from valve ‘A’. When the sliding cylinder reaches the topmost position then this sliding cylinder is filled with low-pressure liquid. The valves ‘A’ and ‘C’ are closed when the sliding cylinder completely filled with low-pressure liquid. Now the valves ‘B’ and ‘D’ are opened, the low-pressure liquid from the supply i.e. through valve ‘D’ enters into the fixed cylinder which pushes the sliding cylinder to move downwards which results high-pressure liquid is produced in the sliding cylinder. This high-pressure liquid is supplied to the required output or to some hydraulic machinery. High-pressure liquid comes out from the valve ‘B’. This cycle is repeated continuously and low-pressure liquid comes out with high-pressure intensity. The hydraulic intensifier is used to supply high-intensity pressure where ever need. It used where the pump is not sufficient to provide a high intensity of pressure as per the requirement. It is most commonly used in the hydraulic press, hydraulic ram, hydraulic cranes and hydraulic lifts etc where the high intensity of pressure is required to lift the loads. A hydraulic intensifier is a compact device and very easy to operate and control. It can be directly attached to the hydraulic machinery, where ever it is needed. It is a compact as well as an energy saving device. It is a cheaper device if we look about its working, it saves a lot of money by their easy and economical operation. We can say that it is simple in working, safe and economical in operations. It has a high-speed operation due to this it can be easily started and stop as per our requirements. It can easily work with the pump, that’s why it may be attached in between the pump and the hydraulic machinery. It is very easy to operate and control. It provides constant force and pressure during the whole working process. The main disadvantage of the hydraulic intensifier is same which mostly occurs in case of the all other hydraulic systems i.e. leakage of the fluid. Sometimes the hydraulic fluid used is maybe corrosive which damage the out machinery. The other main disadvantage is of leakage fluid can catch fire so the working should be done in a proper manner and try to avoid any small leakage of the fluids. This system requires high maintenance. This is all about hydraulic intensifier. If you have any query regarding this article, ask by commenting. If you like this article, don’t forget to share it on social networks. Subscribe to our website for the more informative article. Thanks for reading it.